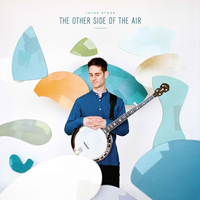 Canadian banjo player Jayme Stone departs from his world music explorations and ventures into the world of classical music on his latest albumThe Other Side of the Air . In addition to the classical elements, The Other Side of the Air incorporates West African, American roots music and some jazz improvisation. The arrangements, however, feature a chamber atmosphere with musical instruments from the world of classical music so don’t expect ngonis or talking drums in the West African-inspired pieces. The lineup on the album includes Jayme Stone (banjo), Rob Mosher (woodwinds), Kevin Turcotte (trumpet), Andrew Downing (cello, bass), Joe Phillips (bass), Nick Fraser (drums, percussion), Aleksandar Gajic (violin), Aline Homzy (violin), Kathleen Kajioka (viola), Amy Laing (cello), Anne Thompson (flute), Clare Scholtz (oboe), Peter Lutek (bassoon), William Carn (trombone) and David Quackenbush (French horn). On The Other Side of the Air Jayme Stone presents an impeccable performance of banjo in the context of a classical music ensemble.